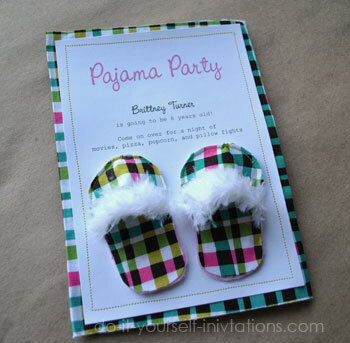 The inspiration for these unique pajama party invitations came to me by way of those cute and fluffy, super comfy pair of slippers that just about any girl should own at any age. When I think of wearing my pajamas there is always, never fail, a pair of comfy slippers involved. 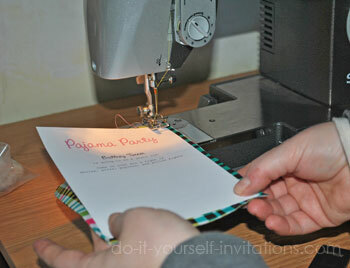 I created this invitation using some funky fabric I had on hand, paired with felt and cardstock. But you could just as easily pull the whole project off using paper alone! Hand stitching or machine stitching is completely optional! Step One: Start by downloading and printing our slipper (or optional sleep mask) pattern/template. Cut out the pattern pieces and lay them onto the fabric or decorative paper you have chosen to create your slipper embellishments. You can simply hold the pattern piece over the fabric/paper and trim to teh same shape, or even trace the shape onto the materials and cut the shape out by cutting on the lines. You should have cut two slipper feet, two pieces for the upper part of the slipper, an optional different colored paper or felt for the bottom of the slipper (I used pink felt) and some feather trim to attach to the top of the slipper. Step Two: Sew the top part of the slipper to the feet. I used some liquid stitch to hold together the two bottom pieces of the slipper and simply held the top part in place while I sewed. Start at the middle top of the slipper and sew to the right side. Then starting at the left side sew to the top center. Snip any loose threads. Continue following the same steps for the second slipper. I sprayed a fabric stiffener to the slipper after sewing to give it some extra stability. Use some liquid stitch to glue on the feather trim. I added a couple of very small hand stitches st the outer edges to hold it firmly in place while it dried. Step Three: Using one of our free printable invitation templates type the wording for your invitation and print it onto some heavy white cardstock. I like to play with fonts and color when adding the wording to the invitations. Our free templates will allow you to change fonts and font color/sizing as well. I chose a nice big pink colored lettering using the font "Pinafore" which is available for free download off the net. After printing the template use the handy cutting guidelines to trim the paper to size. This will create a 5 by 7 invitation. If you would like to add a backing paper or fabric you may want to trim it to a slightly smaller size. Step Four: Cut a piece of decorative paper or fabric to 5 by 7 inch rectangles. Center the printed invitations over the 5 by 7 rectangle to sew in place. You could even use a glue runner to hold it in place for you by just applying a couple of little dabs. 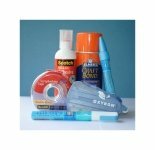 Using a sewing machine, or hand stitch (there are even some nifty little paper sewing tools called "Sew Easy" available for sewing scrapbook pages) stitch along all four edges of the paper. 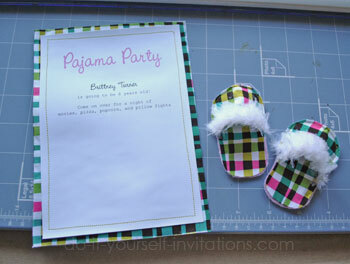 Step Five: Use some craft glue or glue gun to attach the mini slipper embellishments to the front of the pajama party invitations. Let them dry and you're done!